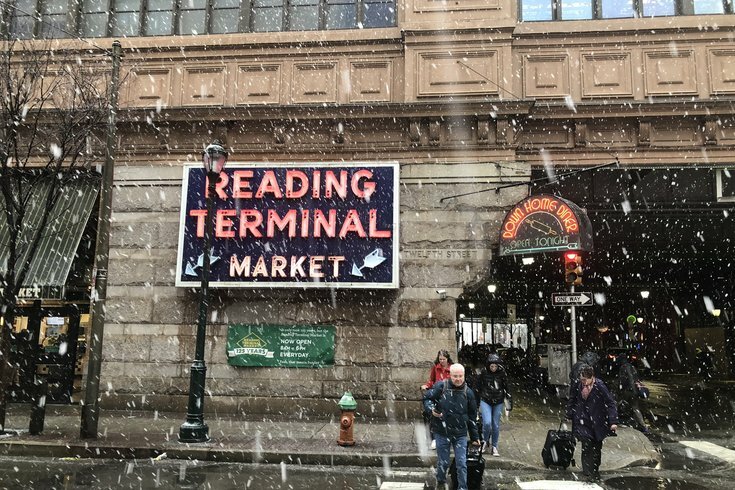 Snow falls outside Reading Terminal Market as a nor'easter moves through Philadelphia. 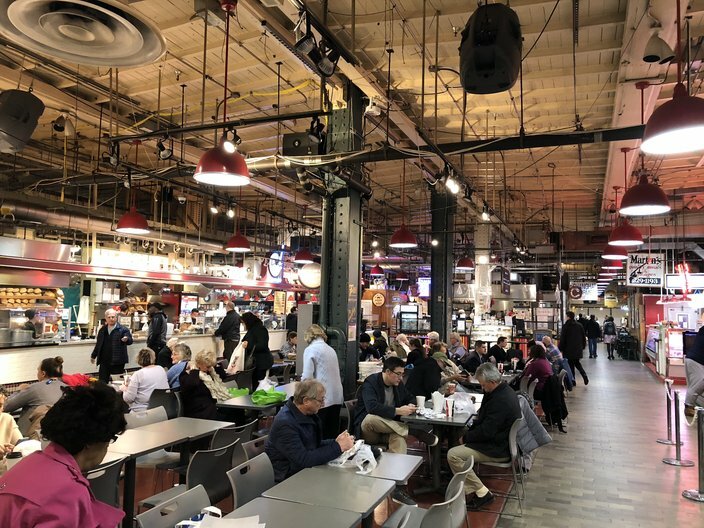 For people who dislike crowds, Wednesday marked the perfect weekday to visit Reading Terminal Market. The market – typically jam-packed with people at lunchtime – was refreshingly void of long lines. People easily meandered through its many aisles, receiving food with expediency. And seats – usually a scarce commodity – could be found easily. Of course, visitors had to battle a slow-to-develop snowstorm to enjoy that unusual calm. But dozens of people did just that seemed to revel in the relative silence. Reading Terminal Market was one of the few Philadelphia attractions that remained opened as the nor'easter passed through the region. "It's not bad if you don't mind the wetness of the snow," said Janee Taft of Northwest Philadelphia. "It's more rain than snow." Taft made the trek to Reading Terminal Market with her fiance, Kenneth Mack, and her four-year-old daughter Jolie. They purchased some vegetables for dinner. "Everywhere else was closed," Taft said. "The Movie Tavern was closed. We thought about going to Golden Corral." But many chains were closed, too, she said. Indeed, most businesses, museums and attractions closed due to the nor'easter, which is expected to dump 6-8 inches of snow on Philadelphia before it moves out Wednesday night. But like the market, some bars pledged to remain open on what was a snow day for many. 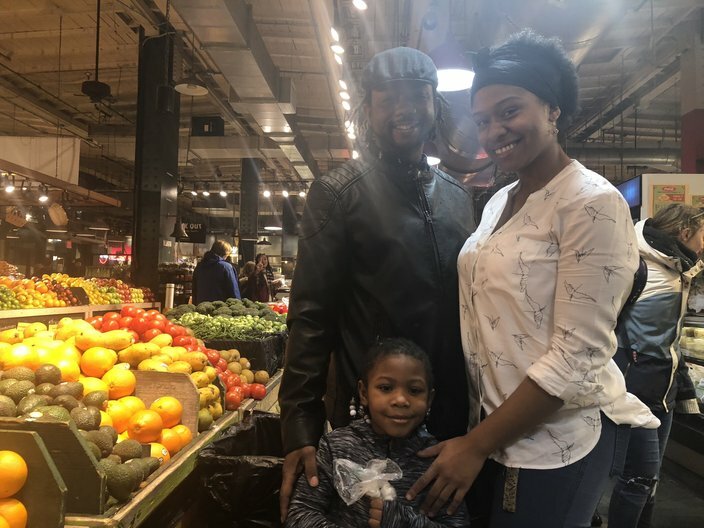 Kenneth Mack, Janee Taft and four-year-old Jolie Taft, of Northwest Philly, shop for vegetables at Reading Terminal Market despite a snowstorm. The Philadelphia Flower Show, which tends to attract a snowstorm or two each year, also stayed opened – as always. The show, located across the street in the Pennsylvania Convention Center, was driving much of the traffic inside Reading Terminal Market. "That's the only reason there's anybody in here," said Stephanie Long, shift manager at Metropolitan Bakery. "Normally, when it snows, it will be a ghost town." Long described business as "super slow" for a weekday – particularly for the Flower Show, one of the farmer's market's busiest weeks. "Nobody is coming in," Long said. "We have all the extra bread for the Flower Show. Everybody showed up yesterday." Molly Iovine, a server at Molly Malloy's pub, echoed those thoughts. At 11:45 a.m., she had only seated two tables at the bar, which has its own private seating area within the market at 12th and Arch streets in Center City. "For the Flower Show, it's usually insanely busy," Iovine said. "By now, we would have a fully packed restaurant. We don't." Iovine hoped business might pick up during the lunch hour, and perhaps at varying times later in the afternoon. But as she spoke, the long-anticipated snow had finally begun falling steadily outside. 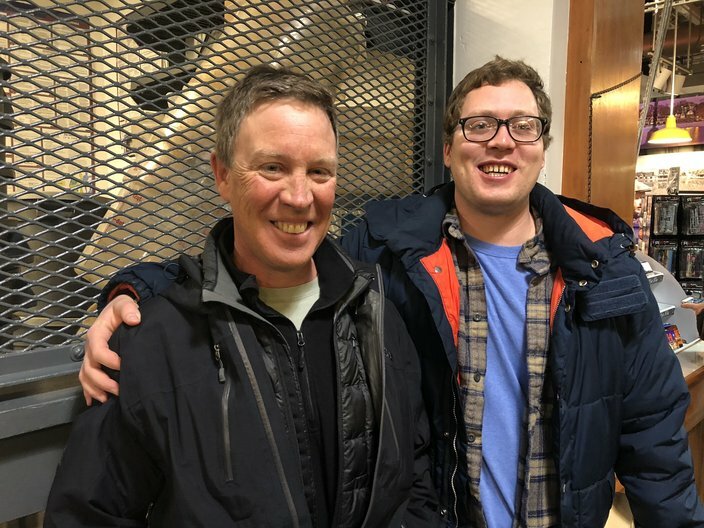 Karl Fuelling, 58, of Burley, Idaho, and his son Mathias, 27, a PhD student at Temple University, enjoyed a trip to Reading Terminal Market as a nor'easter moved through Philadelphia on Wednesday. Earlier in the morning, Philly mostly had received rain. "It's not bothering me," said Taniesha Womack, 31, of North Philadelphia, as she munched on a corn beef sandwich. "I don't think the snow is going to be as bad as they say it's going to be. I'm getting around just fine." Womack was enjoying a day off from work. So were Ryan Barbieri, 33, and his wife, Megan, 30. They took an Uber from their home near Penn's Landing to enjoy the Flower Show. With a free day, they figured Wednesday morning marked a great time to visit the annual show for the first time. "It was really awesome," said Ryan Barbieri, who particularly enjoyed the live butterfly exhibit. "We had heard about it for years and never gone. I would reccommend it to anyone." With many attractions closed in the city, Reading Terminal Market became a destination for some visitors looking to experience Philadelphia. The seating area at Reading Terminal Market is typically filled with people. But seats could be easily found on Wednesday, as a nor'easter pummeled Philadelphia with several inches of snow. The Fuelling family, of Burley, Idaho, found themselves at the market in lieu of a trip to the Philadelphia Museum of Art, which had closed due to the weather. The Fuellings – Karl, 58, and Cynthia, 57 – were in town to visit their 27-year-old son, Mathias, a second-year Ph.D. student at Temple University. "It's a lot more food," Karl Fuelling said of his first trip to the market. "I thought it was going to be more crafts." Still, the Fuellings said they were glad they could enjoy the market – without the usual crowds. "Apparently, it's a slow day," Karl Fuelling said. "For us it seems to be busy." Business likely will pick back up again on Thursday, after the nor'easter has moved out of the region. At least, the vendors are hoping that's the case. "Yesterday was really busy," said Anna Mae Glick, of Beiler's Bakery. "Today is slow. I don't know what the rest of the week is going to be. We'll see."